A planted aquarium substrate should not be too large or too small (usually between 3-8mm per grain). This is to accommodate root growth; grains that are too small will suffocate and crush roots while large grains won't provide enough contact with the roots. A planted aquarium substrate should not affect the water chemistry negatively. Many substrates are designed for other uses, including salt water use, and may leech minerals and salts into the water. For example, crushed coral leeches calcium into the water of an aquarium. This can raise the pH and KH (carbonate hardness) in a freshwater planted aquarium to damaging levels. Substrates that maintain a constant pH level may also be undesirable, as different plants thrive under different conditions, and changing a substrate is probably one of the most difficult procedures to complete in an established aquarium. The most valuable input and feedback on popular planted substrate brands comes from hobbyists themselves, and much of this information has been taken from planted aquarium forums. Therefore, you'll get much more information than just what it says on the label. 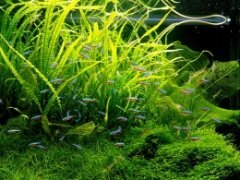 If you have a chance, do a search for planted aquarium substrate or one of the following brands on a planted aquarium forum, such as Aquatic Plant Central. Just remember to take what you find with a grain of salt, as these are often extremely un-scientific reviews. One of the top planted aquarium substrates today, Eco-Complete is a balanced, easy to use substrate. It comes populated with beneficial bacteria, so if you are starting a new tank, you can jump-start the cycling process. It also doesn't require rinsing, which is a big pain to have to do, and an even bigger pain later if you don't do it! It comes packed with essential nutrients and minerals required for live plants and shouldn't impact your water parameters (Unless you bought a really old bag, as they did have a few quality problems about a year ago. These can be identified by milky white liquid in the bag, but they will replace the bag for free). The grain sizes are within range for optimal root growth and the appearance is of a deep black sandy gravel. It's also rounded gravel, and poses no threat to bottom feeding fish which may hurt themselves on sharp edged substrate. I use Eco-Complete almost exclusively, and for the price, you can't buy a better substrate in my opinion! Flourite has been around for a while and is not as technologically advanced as other substrates available now but is still an old stand by. It is a clay based substrate with a reddish color that comes from its high iron content. The major drawback with Flourite is that is needs to be rinsed extensively before putting it in the aquarium, otherwise it will severely cloud up the water. It's also larger than other planted substrates and may pose a problem for plants with small, delicate roots. It doesn't have as much or as many minerals and nutrients as other planted aquariums substrates available today. However, you can't really go wrong with Flourite: it's tried and true. Supposedly the best planted substrate money can buy, Aquasoil is researched and manufactured by Takashi Amano's Japanese company, ADA. There are several different varieties, based on biotopes from around the world. These range from Amazonia to Malaya and Africana, all with different colors and properties to simulate the biotope for which they are named. Made up of round grains, the substrate maintains gaps allowing for water circulation to prevent roots from suffocating, although now they also sell a powdered version to make the top level of the substrate more attractive. It's engineered to lower the pH and general hardness (GH) of the water (this effect is not to be confused with the lowering of pH associated with adding CO2; simply lowering the pH using Aquasoil is not adding any CO2!). Most plants grow better at a lower pH of about 5.5-6.5. If that weren't enough, Aquasoil also acts as a passive filter, capturing floating particles. Nobody knows exactly what it's made of, but it maintains its shape long-term and provides nutrients for root feeders. I haven't been feeling wild enough to start a tank with Aquasoil yet (even though the price is now quite competitive) but others who have swear by it. If you don't have a large tank, or like knowing you bought the best money can buy, Aquasoil is for you. Diana Walstad's book, Ecology of the Planted Aquarium, is your bible for using regular potting soil. Most people who use soil are following her methods to create a "el Natural" style aquarium. The benefits of this style is that it requires very little maintenance or fertilizing. However, using soil submerged can be very challenging and there are many ways to do it wrong, leading to certain disaster. Like in nature, a soil substrate does grow plants very well. If you plan to use soil, definitely read her book or ask around on planted aquarium forums for advice! Believe it or not, regular intert gravel can also be used quite successfully as a planted aquarium substrate. More intensive fertilization will have to be done to maintain more demanding plants, but it is possible. If going this route, try to get smaller gravel as most gravel sold will be large and difficult to root small delicate plants and stem plants with shallow roots. If you already have an established aquarium with gravel, this is ideal, as the fish mulm has already accumulated in the gravel and will act as a fertilizer. If you are starting from scratch, root tabs or other substrate fertilizers can be used to give plants a boost until the mulm builds up. Sand must be used with caution as a planted aquarium substrate. It is very attractive, but has many downsides. First, it tends to compact, making it very difficult for roots to grow into it. Secondly, this compacting can lead to reduced circulation and pockets of anaerobic (not requiring oxygen) bacteria thriving, creating toxic gas bubbles. To prevent this, it's best to either layer one of the other planted aquarium substrates underneath the sand or use a very large grain sand. Overall, sand is best reserved for an accent area, creating a sandy beach effect, and is not ideal for growing plants. I almost bought this planted aquarium substrate as it was attractive and not too expensive. However, I looked up other's thoughts online and found out that although it is a great planted aquarium substrate for the first year or so, it requires replacing (it even says so on the label). Otherwise the granules, shaped similarly to ADA Aquasoil granules, will begin to lose their shape and "melt" into mush. This can be disastrous. Coupled with the fact that changing the substrate in an established tank is all but impossible without totally destroying it, this planted aquarium substrate is one to avoid unless you tear down your aquariums every year. This is not really a substrate but more of an additive to substrate. It is a form of clay that contains iron and acts as a sponge to store nutrients, but is meant to be mixed into the existing substrate (usually inert gravel). However, it is clay, and thus gradually softens into a mud-like substance that if disturbed, will cloud your tank dramatically. If, like me, you move plants around frequently, this can mean a cloudy tank all the time. 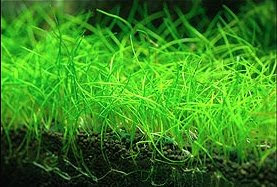 So these are the top planted aquarium substrates and those to avoid as a planted aquarium substrate. There are many more options, but these are less common and more experimental. You can find an infinite number of combinations of materials and their performances on planted aquarium forums. As for substrate depth, 2-3 inches is generally the rule of thumb. Shallower than that will lead to problems with roots not being able to go deep enough and it will be hard to anchor plants. Much deeper...well why would you make it much deeper? You're keeping a fish tank, not an ant farm! Good luck! This tiny catfish comes from warm waters in South America and is mainly a bottom dweller. Since they are so small, they are quite shy and shouldn't be kept with aggressive tank mates. Live bearers, other smaller corydoras, or tetras are ideal. If comfortable, they often just lounge out on the substrate motionless except for their little eyes. They should be kept in schools of at least 3 as they are schooling and social fish. Unfortunately, they are extremely delicate fish, and I had 2 of my 4 die on me in transit from the pet store or shortly after being released into the aquarium (habrosus means soft or delicate). This was either from trauma during transport or being caught or just stress from the whole endeavor. They also need to be fed smaller foods, especially if they are competing for food with other bottom feeders. They will eat almost anything, but sinking wafers are probably best since they dissolve into small pieces and the catfish won't have to live off the pickings that sink to the bottom from regular fish food. These are the reasons I've rated these as Intermediate for a skill level. My Corydoras habrosus were sold to me as a pygmy corydoras, but when I actually researched them further I found that they were in fact Corydoras habrosus. 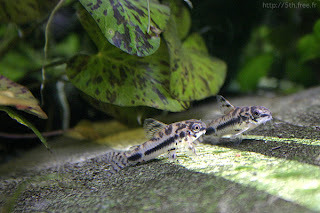 They differ from the pygmy corydoras in the fact that they are speckled with black spots and have a blotchy line running from head to tail, whereas the pygmy corydoras have a single solid black stripe running from head to tail. Otherwise, they are very similar in size and behavior. Just be aware that they may be sold as pygmy corydoras, a name which has been used to sell a number of different corydoras species. So it's been a while since I've posted, and I'm sad to say it may be a while before I post again. Don't worry, it's not the end of the blog by any means. I've just been busy getting ready for a two week vacation which I'm leaving for tonight. Hopefully when I get back I'll have a little more time to write some new Aquascape Analysis articles which seem to be a big hit. So look for some new posts around the 24th of April!